Illusions. With a quick flick of the wrist or movement of the hands, things that were once visible can disappear, and the once hidden can be staring you in the face. 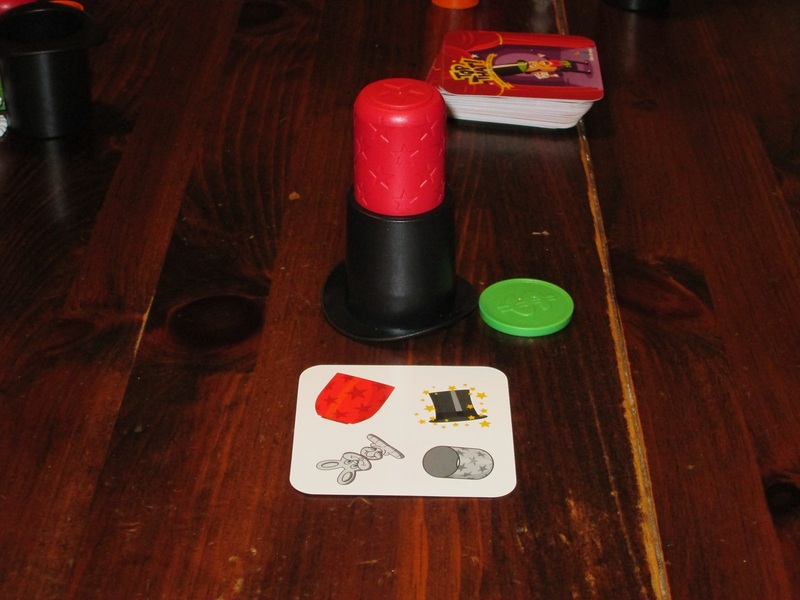 In this contest of magicians, players must put on their thinking caps to arrange the magical items in a stack. But only the fastest will be the victor. So put on your white gloves and ready your top hat–it’s your turn to put on a show. 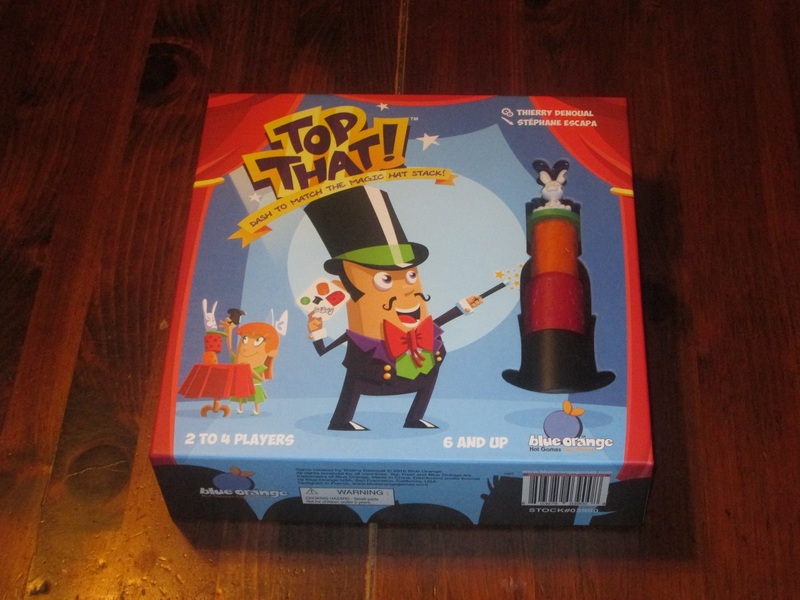 Top That is a speed stacking game for two to four players. Each round players rush to arrange their pieces in a stack. The first to complete a predetermined number of arrangements first wins. 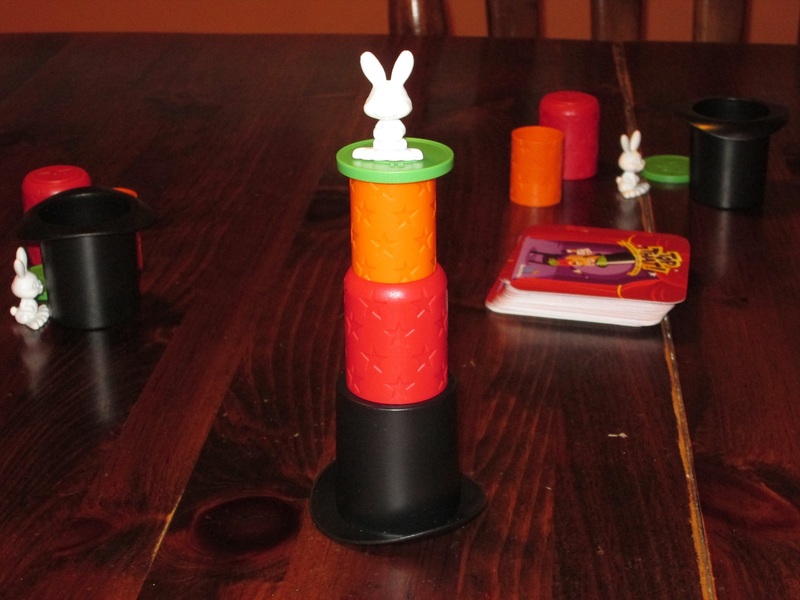 Each player receives a black top hat, a large red thimble, an orange tube, a green coin, and a white rabbit and lays out the pieces in front of them. 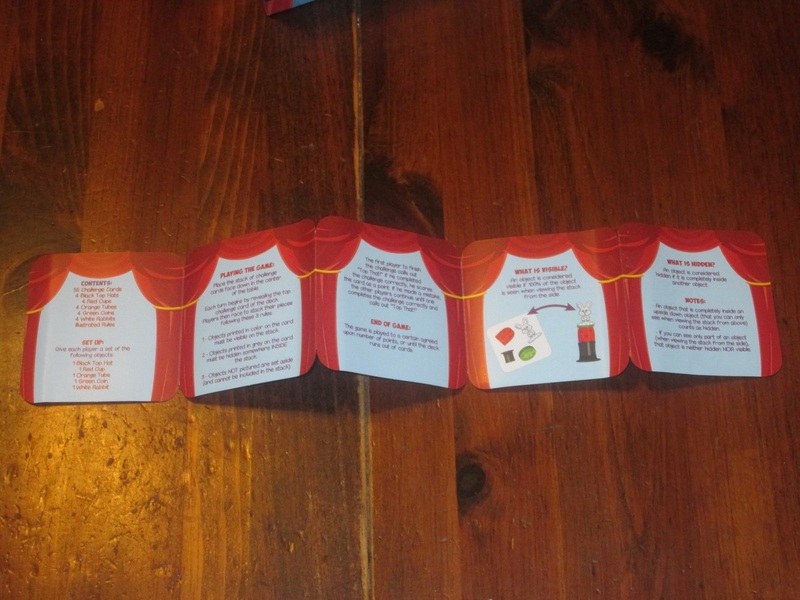 Each round a card is flipped up. Top That set up for four players. Once the card is flipped up, players rush to arrange their pieces according to what shows on the card. If an object is in color, then it must be visible in the stack. If an object is in gray, it must be hidden in the stack. If an object isn’t shown, it must be set aside. 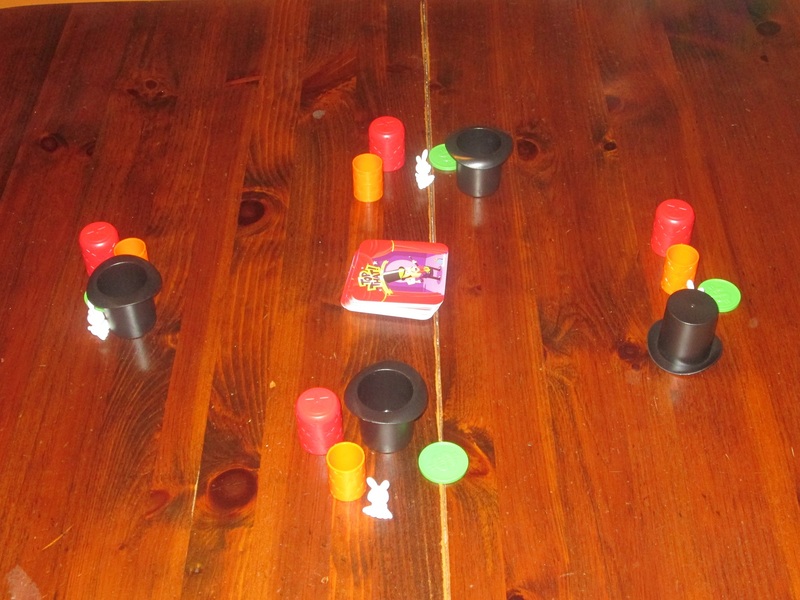 Once one player completes the arrangement, he or she yells, “Top that!” All players stop, and if correct, the yelling player collects the card; if not, the other players continue building until one player is correct and collects the card. Once one player collects a predetermined number of cards, that player wins. This stack is correct. 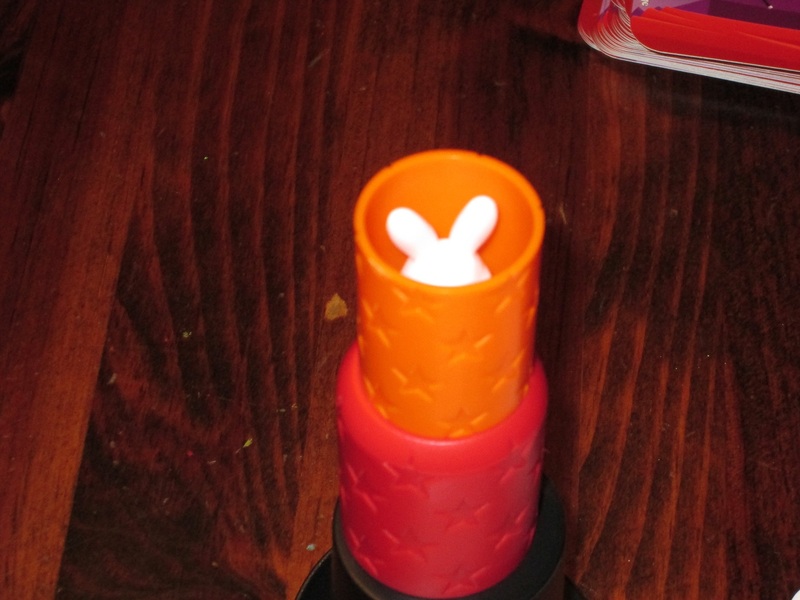 The orange tube and rabbit are hidden, and the coin is set aside. Players may also use an included variant that pays attention to stars on some of the cards. If an object has stars around it, it either can’t have something hidden inside it or must have something hidden inside it, depending on how players want to play. Oh Oh It’s Magic, or My Least Consistent Trick? Blue Orange has been making a name for themselves with fast, fun puzzle games for children and adults. I recently reviewed their Dr. Eureka, a puzzle game of logic, marbles, and test tubes. How does Top That stack up? Top That stacks up very well–at least where kids are concerned. The rules for Top That are incredibly simple. The rulebook is just a few frames on small, square paper, and the back of the rules sheet is mostly advertisements for other games. So teaching this game is a breeze, even if your students are young kids. This initially made me wary of the game. Surely something this simple couldn’t be very good. But the great thing about Top That is that it gets kids’ minds going. When I turn over a card, it’s pretty easy for me to know exactly what to do right away. There’s not much skill in the game for me (although even I make mistakes or misjudgments in the heat of the moment). For adults, it’s a game of speed, full stop, and if you want a speed game, I think there are better choices (like Dr. Eureka, Ghost Blitz, or Gloobz). But for children, Top That presents just the right level of challenge. It’s difficult enough to know the order of operations, and there are enough elements that they will occasionally get the puzzle wrong. It’s fascinating to watch the wheels turn in their heads as they try to understand. 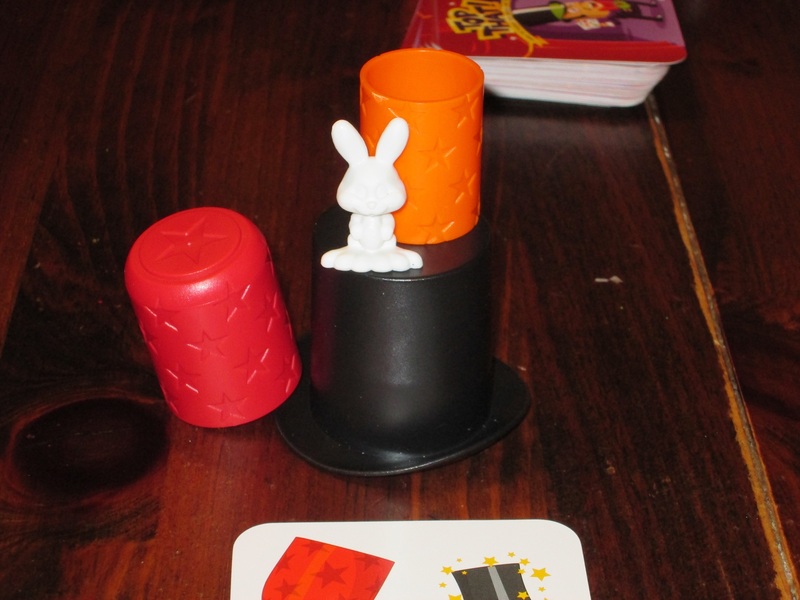 Okay–I have to hide the rabbit and the orange tube, but I can’t use the top hat, and the coin must be visible. How do I do that? The rules to Top That. As I said, it is a simple game to teach and learn. 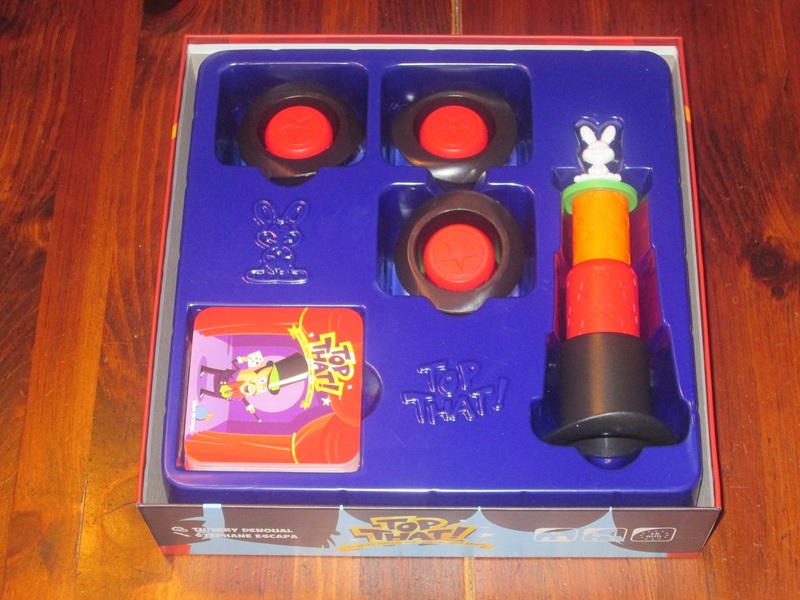 I played this game several times with my nieces–aged four, five, and seven. There was certainly a speed gap between the three, but what surprised me was how all three were engaged and able to participate. The seven-year-old was the fastest and got the puzzle right the most, the five-year-old was right most of the time but slower, and the four-year-old got the puzzle right sometimes, but she needed coaching. And I think this is where Top That shines: it’s a good game to coach young kids through pattern recognition, logical thinking, and fine motor skills. That may not sound like it would be very fun, but I was surprised how all three of my nieces kept requesting to play the game, even though if I was playing, I would win; or if I sat out, my oldest niece would win; and so on down the line. They enjoyed the puzzle, even without the game aspect of it. So the game does double duty: it works as a speed game for players of similar skill, or it works as a fun logic exercise for younger kids. All the pieces, stacked up. For a game whose pieces easily hide inside each other, the game’s box is huge. This is my least favorite part about the game. As you’ve probably gathered from what I’ve already written, Top That has the main drawback of most speed games. That is, if you aren’t the fastest, losing can be demoralizing. In the first game I played with other adults, I won the game before my opponents could reach a second card. With adults, the players are generally self-deprecating about losses. It’s not a big deal, and everyone moves on. (This isn’t the kind of game you’d play for hours at a time, usually.) The speed gap is a little more pronounced in kids, especially kids of different ages, and there the attitude toward loss varies from kid to kid. When playing with my nieces, I would make some of the older players (my oldest niece and I, for example) “practice” so the younger kids could get a feel for how they should be playing. In this context, with multiple ages, it was most fun when I was coaching the kids in making their stacks. But I could imagine that with kids who are the same age, this would be fun as a game. There are rabbits everywhere. You just have to know where to look. For being a simple concept, Top That offers a decent amount of decisions for young players to chew on in a fun and attractive package. The speed element will appeal to some, but I think the game truly shines as a tool for honing logic skills, and the brightly colored playing pieces are the spoonful of sugar to help the medicine go down. Top That is educational without feeling educational, and that is a huge boon among children who can sniff out the slightest scent of didacticism. It’s an okay diversion with adults, but this is one I’d plan to play with the kids. And once you do, they’ll probably be asking to play some more. iSlaytheDragon would like to thank Blue Orange for providing us with a review copy of Top That.